Epigenetics is the study of cellular and physiological traits that are not caused by changes in DNA sequences, but rather by the effects of our environment. There are many daily environmental factors which will affect the way in which our genes express themselves and therefore influence our overall cellular optimisation. Your DNA, the Environment, and Epigenetics from UW CEEH on Vimeo. Epigenetics shape your health more profoundly than your genome. Epigenetics say that you can inherit certain negative traits from previous generation, but on their own they will not be very significant. For the traits to have bigger impact, there have to be a catalyst, in the form of our lifestyle, daily choices, exposure to certain toxic chemicals. So our health is shaped by our Epigenetic Profile more than anything else. This Epigenetic Profile is the sum of our interactions with the environment. That is why to be more successful in prevention, recovery and promotion of health and vitality, one needs to look towards examining Epigenetic factors i.e. your daily choices and behaviours, nutrition, stress, radiation, EMF pollution, environmental toxins, amalgam dental fillings, pathogens and of course ones own mindset. Epigenetics is the field of study that assesses the mechanisms by which environmental information interfaces the genome and controls genetic activity. Previous to epigenetics, science and the public were preoccupied with a belief emphasizing “genetic control,” the belief that genes controlled their own expression. New insights reveal that genes do not control the fate of cells. They are simply blueprints for proteins, the cell’s molecular building blocks. Genes are activated and controlled by the cell’s response to environmental cues. In fact, the astonishing finding in epigenetic science is that environmental information can modify the readout of each gene so as to create more than 30,000 variations from each blueprint. 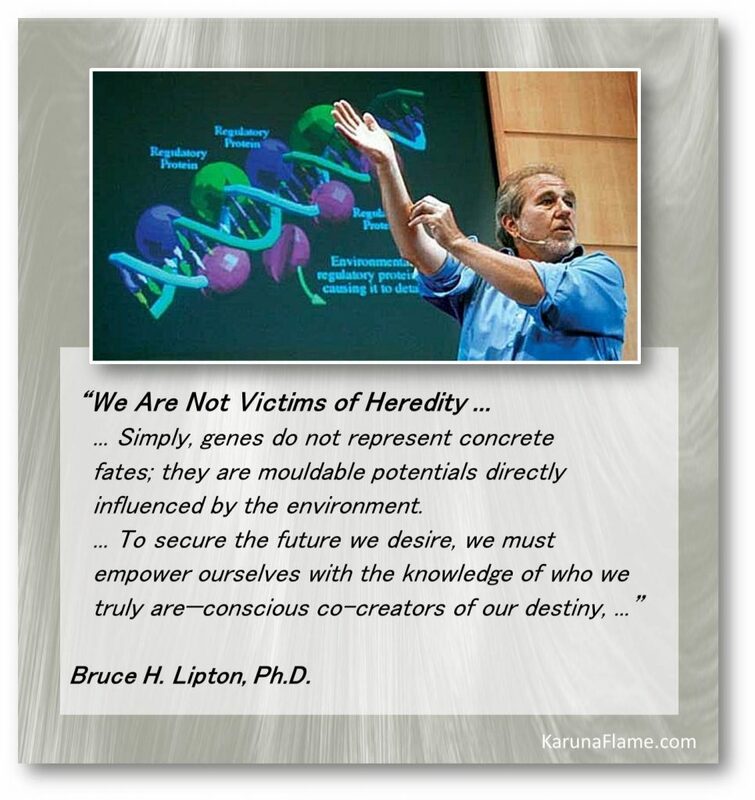 Simply, genes do not represent concrete fates; they are moldable potentials directly influenced by the environment.